This is pretty straight-up. Lard is just more rewarding, dontcha know? Pretty awesome work, Peter. But then your work always is. Thank you! Bookmarking for when this study hits the news (if it does) and the headlines read"Lose more weight with Safflower oil than lard." I must be reading to much Jung lately. Last night I was reading through the rest of your posts on physiological insulin resistance and then this morning a new one. I'd expect FBG to rise higher with long term high-fat consumption. I'd have a tendency to think that if it didn't that means someone is cheating... I'm thinking a rising FBG is like a highway where all the people are perfect drivers going to their appropriate destinations and taking the correct exits and not getting lost i.e. this is an effect of increasing efficiency. 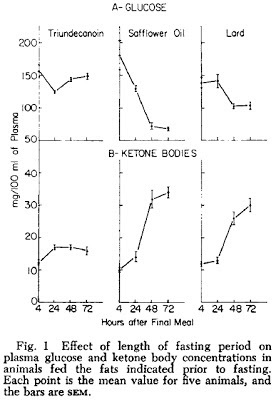 If rats have about a 6x metabolic rate - would it be wrong to assume that 22 hours of fasting would be similar to 132hours for a human? or an 11 day fast? raiding the refrigerator - this was a condition called "night starvation' in the days before fridges. Margaret, bit late for a 1975 paper now! 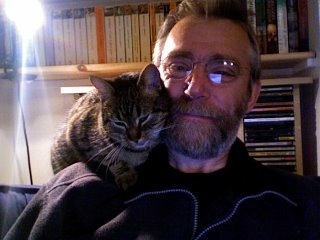 Edward, ta for the heads up, addendum is up. Gadfly, I'm a CICO person, I just don't think we measure well enough to see where the metabolic advantage calories go. They go somewhere! Somewhere OUT. 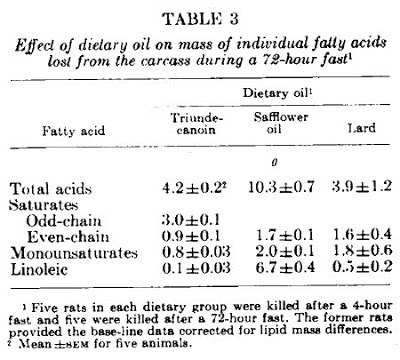 Bill, they measured linoleic acid in everything except adipose tissue. These clowns crack me up. They still don't know if caloric loss in to adipocytes triggered the rise in endocanabinoids or whether the overloading of the brain supply of arachidonic acid forced overfeeding. How do you tell? Simple overeating requires insulin resistance to deal with caloric overload through this overeating. Caloric loss in to adipocytes secondary to linoleic acid accumulation in them causes increased insulin sensitivity. 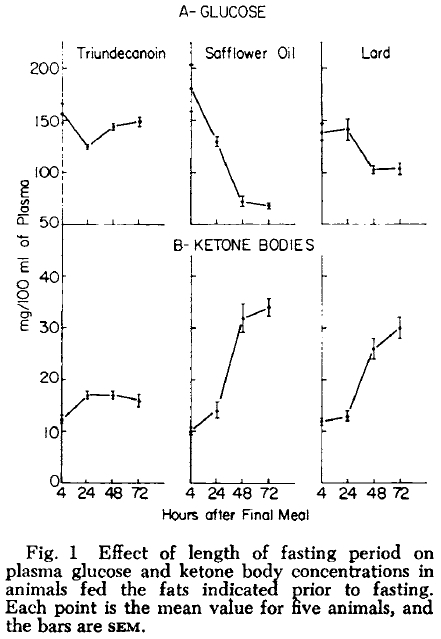 The added complication is the fact that linoleic acid increases insulin sensitivity per se. Makes my head go round. But the paper is by people so focused on the brain that they don't even consider adipocyte fat composition worth analysing (if it's the paper I'm thinking of). mmm, interesting findings! ( eats a huge bag of salted peanuts roasted in vegetable oil, a bucket of ice cream coated with awesome hfcs liquids , big chicken , and 200 gr of sugary chocolate... in that order... remains super lean. im starting to feel fructose and pufa makes no frigging difference... i still eat meat, cheese and 10 yolks- gmo soy fed- most days... and also drink liters of supermarket milk, (insuliinnnsss)but most days im eatin whatever the hell i want. no damage so far. a year. maybe is the fasting? also, i had a bunch of potatoes mixed with oily mayo with that chicken! and the chicken was fried... in vegetable oil! ( and i bet they used that rancid oil multiple times, koss i ate this in a old gas station in the middle of nowhere ) also road trip so no activity at all, just sitting for 30 hrs . fasting... ah lately im doing lots of cereal with the milk. awesome. One thing I've noticed about people who intermittently fast is that they are all rather obsessed with food. Night starvation, perhaps? Never tried continually fasting for more than 14 or so hours, so I guess I cant really talk. I've seen many people follow Leangains become food obsessed, but then again that often couples fasting with caloric restriction. As a side note, fasting means your body is running on palmitate 90% of the time. A nice F/N ration there. Might be the fasting is a band-aid over an otherwise broken eating style. Or maybe you're just lucky.